The gloomy Skull Woods is described by many as a maze of bones, trees, and gaping holes. Thick foliage and huge skulls on the forest floor cause many adventurers to retreat quickly. Those who stay discover that the skulls and holes lead to Mothula's underground dwelling. 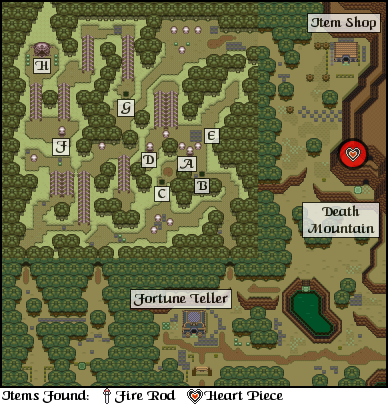 The Skull Woods are situated north of the Village of Outcasts and west of Death Mountain. Just south of the woods, at the edge of the village, a Fortune Teller tells explorers of special points of interest in the Light and Dark Worlds. East of the woods, a Death Mountain cave leads to a valuable and hard to reach item. The rest of the region is dominated by the dark forest and Mothula's underground lair. A shop can be found between the mountain and the woods. It offers the same items for the same prices as many other shops in the Dark World. If you need Bombs, Life Potions, or a first-level Shield, you can get those items here. A sign outside of the cave in this region reads "I'll give a Piece of Heart to the person who wears the Cape." The sign's author refers to the Magic Cape, which makes those who wear it invisible, and the Piece of Heart found above the cave entrance. Inside the cave, the way to the Piece of Heart is blocked by a huge Bumper. Grapple over the large gap, then put on the Magic Cape to slip past the Bumper and earn the prize. A mystic man set up shop on the northern boundary of the Village of Outcasts. For a few Rupees, this wise wizard will spin tales of special places and hidden treasures. His Crystal Ball knows of many secrets in the Light and Dark Worlds. Back in the Light World, the tree that the Lumberjack Brothers were originally working on before you dealt with Agahnim has been abandoned. The brothers commented on how unusual the tree seemed as they were cutting it. Indeed, when you find it, it is a different color. Since a lot of it has already been cut, it wouldn't take much to push the rest of it over. One solid Dash Bash will do the trick. In the stump, you will find a stairwell that leads into the ground below. Underground, you will find another Piece of Heart. Although this walkthrough guides you through each of the dungeons in their numeric order, there are occasions when visiting the dungeons out of order can make the game a little easier. This is one such occasion. After completing the second dungeon, you may opt to visit the fourth dungeon before taking on the third. If you obtain the dungeon's treasure, the Titan's Mitt, you can embark on the quest to obtain the level 3 tempered sword. With the improved sword, you will find completing the third dungeon a little easier. For information on how to obtain the tempered sword, see the Reunion of the Blacksmiths section of the walkthrough. Adventurers from the Light World make their way to this region through a Warp Tile located north of Kakariko Village. By pounding the wooden pegs with the Magic Hammer, they can get to a small clearing south of the woods and lift a rock to reveal the Tile. The passages of Skull Dungeon are connected by a network of dungeon entrances on the forest floor. These underground tunnels are loaded with dangerous traps and villainous creatures. When explorers made it to the end of each passage, they would have to temporarily leave the dungeon and look for another entrance. The entrance to the final chamber is located in the northwestern corner of the woods. 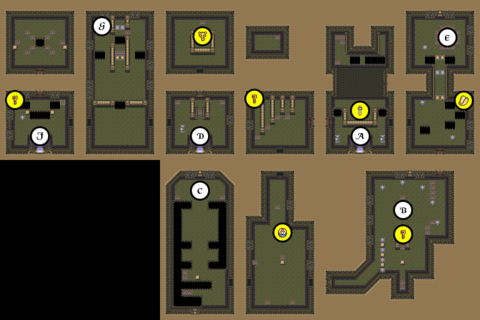 Each entrance to the dungeon is marked by a letter on the Skull Woods map, and the location of the entrance within the dungeon is indicated on the Skull Dungeon map. There are many entrances to the first part of Skull Dungeon, but only one entrance to the second part. Until you claim the Fire Rod, you will not be able to reach the second part, so you must accomplish this task first. Among all of the entrances to choose from, you may wish to start by falling down entrance C.
When you fall into the dungeon, you will have to wander down to the bottom of the current room, past the rotating fire bar, and out through the right door. In the next room, run up past the rotating fire bar and the Pons, and open up the treasure chest to collect the Compass. Opening the chest will cause a collection of pits to permanently appear throughout the floor. Run through the north door to the room above. In addition to one red Stalfos, you will be introduced to two new enemies, the Gibdos mummies and the Wallmaster hand. 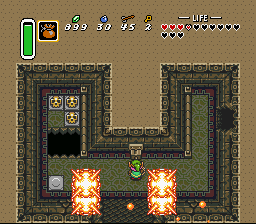 Gibdos are extremely susceptible to fire, so you can use your magic lamp on them until you get the Fire Rod. Otherwise, bash them with your sword. The Wallmaster hand is an entirely different threat. If it grabs you, you will be placed back at the location at which you entered the dungeon. Before you can see it, you will see its shadow on the floor and hear it falling. Step out of the way and slash it with your sword to destroy it. The treasure chest in the upper left corner contains a Small Key. Claim it and return to the room below. Maneuver around the pits and be careful of the blue and red Pons that occupy the room. Return to the bottom of the room and head through the door to the right. It leads to the room that you end up in if you fall through the B entrance above ground. You will want to continue through the right door to this room. This rather wide, open room features two Gibdos and a Wallmaster. You may have entered this room either from the B entrance, or through the door on the lower-left. Either way, avoid the Wallmaster, and make your way towards the three skulls that line up to a treasure chest. Destroy the skulls and open the chest to obtain another Small Key. You'll want to use this key on the door in the upper right corner of the room. The room above is divided into two sections, but you won't be able to reach the top section from this direction. 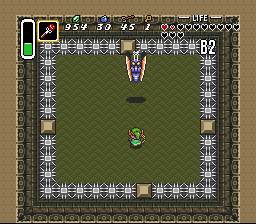 You can, however, manipulate the pits on the floor by stepping on the Star Tiles, so you can access the treasure chest and obtain the dungeon Map. There is little else you can do for now, so enter the room to the left through the left door. This is the location of the A entrance. You will see the large treasure chest with no apparent way to reach it. For now, exit through entrance A, and climb up and around, through the rib cage tunnels, to entrance D.
Throughout this section of the dungeon, you must always be on the lookout for Wallmasters. Also in the room are two blue Baris and two Gibdos. There is a pressure plate between the two barriers in front of the top door. The right statue can be moved and positioned on top of the pressure plate, but clear the room of monsters before you attempt to do this. You'll need to push the statue into the center of the room, and then pull the statue up from the top so that you are next to the door once the status is situated in place. With the door open, you can proceed to the room above. In addition to the variety of monsters in the room, there is a set of five rotating stars. This is a "Bunny Beam" and if you are hit by it, the Moon Pearl will cease to function momentarily, rendering you a helpless bunny until its effects wear off. It's difficult to avoid, but it won't last long. The treasure chest in the center of the room holds the much-needed Big Key. Grab it and, if you like, bomb the right wall. Through the hole you will find a small room with a single skull that contains a large magic refill. You must still watch out for the Wallmaster. With the Big Key in hand, you must now exit through the D entrance and walk back towards the A entrance. However, chop through the 3-by-3 grid of bushes and drop through the hole that you uncover, which serves as entrance E.
You will fall into the top portion of the map room that you could not reach previously. Escape from the skull circle, and investigate the crack in the left wall. Bomb it to open a hole and pass through it. You may find, in the next room, that pits are situated in such a way that you can't reach the switch in the wall. If that's the case, return to the previous room, step on one of the Star Tiles to alter the arrangement of the pits, and return to the switch. Walk over to the switch and pull on it. 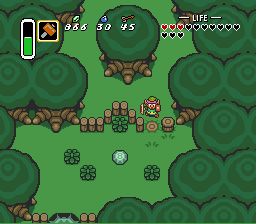 Once the switch is extended, the wall behind you will explode, revealing a pathway to the large treasure chest. There are two Tail Worms that you must contend with, but you can finally open the chest and obtain the Fire Rod, a great weapon against the Gibdos, but it will deplete your magic supply. Once you have the rod, you can escape through the doorway below, by aiming the Hookshot at one of the statues in the lower corners. Once you exit through entrance A, you'll need to make your way back to entrance D again. Your task here is simple. Even though there is a fair bit to explore to the left of the room connected to entrance D, all that you are really required to do is walk two rooms to the left and exit through entrance F. Once you're back outside, you will walk up through the left ribcage tunnel, to entrance H, where you will see a large skeleton-like structure. Use the Fire Rod on it to clear the path, and walk up to the room which leads to part 2. If you were curious about the rest of the dungeon, there is a Small Key in the upper-left corner of the room. Unfortunately, you can't get around the pits to unlock the door above. In order to reach this, you will have to exit through entrance F, and climb up through the right ribcage above the entrance and follow it all the way around to the pit which serves as entrance G. From here, you can make your way back down to the bottom of the room, stepping on various Star Tiles along the way in order to rearrange the pits. If you do it correctly, you will reach the room of entrance F, but there won't be any pits in front of the locked door. Unlock the door, and enter the room above. A series of tiles around the middle of the room will begin to fall away. You can attempt to reach the inside where many of the skulls contain small magic refills, or the outside skulls which contain small hearts. However, you will probably need to use your Magic Mirror to escape the room. 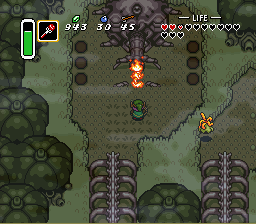 To reach this entrance, you must fire the Fire Rod at the tip of the nose of the large skull embedded in the ground. Lighting the tip on fire will cause the column leading up to the skull to burn, revealing entrance H that leads to the boss of the dungeon. Mothula himself doesn't require a lot of intricate strategy to defeat. He is vulnerable to your sword as well as the Fire Rod (remember that it drains your magic when used). It has a lot of health, so you may run out of magic using the Fire Rod and will have to revert to using your sword at close range. What makes this fight truly difficult is the fact that the floor moves constantly in random directions. In addition to this, the spike traps all around the outside of the room randomly slide from one side of the room to the other. You are warned of their eventual move by the shaking they do just before. It's difficult to attack Mothula and focus on the spikes at the same time. Stay persistent, and bring health and magic restoring potions if you are having a difficult time with this fight. However, by catching a bee in a bottle before the dungeon, and releasing it during this battle, victory will be much easier, as the bee will viciously attack Mothula. Defeat him for a Heart Container, and collect it in order to reveal the next crystal. The maiden of the third crystal won't have very valuable information for you. 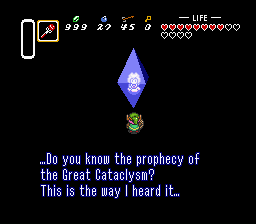 She will simply relate the prophecy that when the Triforce falls into the hands of evil, a hero is destined to appear, one who belongs to the bloodline of the Knights of Hyrule. When you are done, your next destination is the Village of Outcasts to the south of the woods. This page was last edited on 28 June 2017, at 22:03. This page has been accessed 192,847 times.